There wasn’t any real excitement around product launches last week. Of course, we saw new AGVs and AMRs launched – some smaller, some larger and some vendors expanding into new form factors, but nothing eye-catching or ground-breaking. Most of the ‘start-up’ AMR companies had much bigger booths this year (compared to MODEX in 2018). That perhaps illustrated the advancement in where these companies now are. Almost everyone we spoke with reported double- or triple-digit growth in 2018 and a similar outlook for 2019 – though many of these companies are starting from a very small base. Nonetheless, the size of the companies’ booths highlighted the growth and success that’s now coming to fruition. Companies such as Locus Robotics and 6 River Systems had much larger booths that appeared very busy with visitors. Many people commented that the robotics and automation companies were ‘taking over’ the ProMat show and now dominating the floor space. Some of the vendors from Asia, like GreyOrange and Geek+ were exhibiting at the show for the first time. One interesting US newcomer was Berkshire Grey, which recently emerged from stealth mode. The company offers a number of robotic solutions for fulfilment and distribution centers, including a goods-to-person system which can handle inventory totes and outbound order containers at the same time. As you can see from the below slide that we presented at the conference last week, our initial estimates for market growth last year are considerable and we believe will accelerate. It’s easy to see why the market is attracting so many newcomers. All of the major fork truck companies present were showcasing an automated product, perhaps showing they were embracing the technology. Raymond for the first time was showing off both its Seegrid-enabled tow tractor as well as its own automated VNA stacker. Meanwhile, Toyota, which has fully embraced the disruptive automation technologies through acquisitions of Raymond, Bastion and Vanderlande, was also showcasing automated fork trucks last week. The forklift industry has been through a period of consolidation in recent years and now faces the challenge and opportunity of automated products. 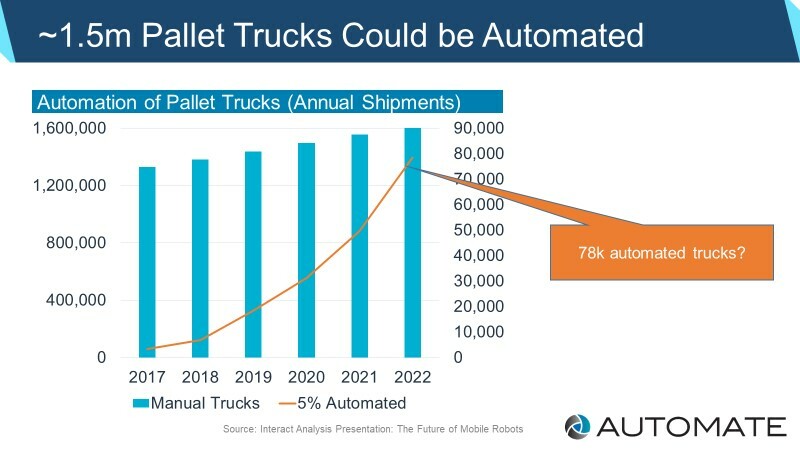 As I showed in my presentation, the replacement of 10% of fork trucks with automated robotic solutions by 2022 (which seems quite achievable) would generate revenues of close to $6bn. The displacement of this chunk of revenue is clearly not something that fork truck companies will want to give up easily. As such all the major vendors now offer at least one automated product and now view this segment as an attractive and high margin opportunity, rather than a threat. It was clear from conversations at the show, that many of the AMR companies involved in automating order fulfilment operations are moving past initial pilots and towards full-scale fleets. The past couple of years has been spent proving the technology, ROI and reliability of AMRs to help improve fulfilment efficiency with each vendor piloting their robots at a handful of customers. Each vendor’s handful is now turning into tens, and pilots are progressing from a few robots to 25-50+ per site. 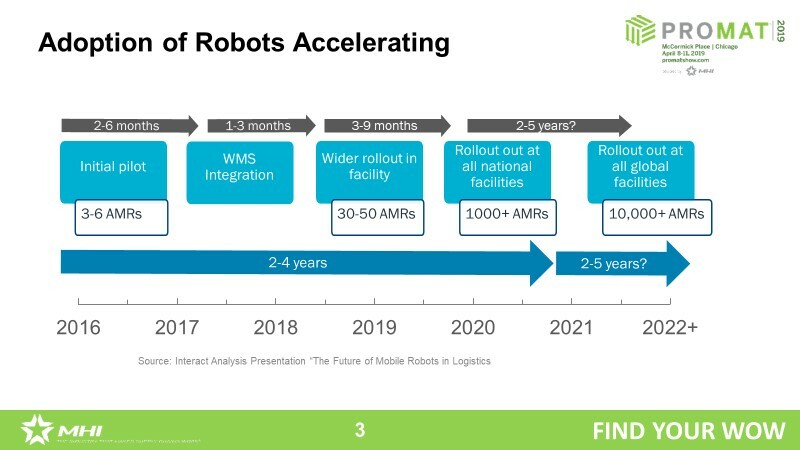 We actually presented about this topic during the conference and you’ll see from the below figure, why we’re forecasting that these kinds of robots are likely to experience exponential growth in the next couple of years. As a result of this we’re seeing some AMR companies being increasingly selective about the customers and projects they take on. Some potential customers reported that they were unable to buy or lease a mobile robot right now. This is partly because AMR vendors are now enjoying the fruits of previous years’ labor and are able to ship dozens or even hundreds of robots to their bigger customers and are unwilling to take on new customers who only want to order on a small scale, or worse still – want to pilot the technology first. Until now, many of these vendors have been offering a RaaS (robot-as-a-service) or rental approach, which whilst being an attractive, low-capital offer to customers; presents the AMR vendor with risk and liquidity problems of their own. Because they now have more of an established customer base, it appears that these vendors are trying to shift away from the OPEX model of RaaS and instead try to capture more upfront revenues. It appears that because of this pent-up demand (due to the underlying drivers of warehouse automation) that these AMR vendors can afford to be more selective – in both the customers they accept, and the sales model they employ. As such, it’s a seller’s market right now. The issue of mobile robot safety was mentioned to us dozens of times last week. The increasing penetration rate of mobile robots and fleet sizes coupled with the larger payloads they’re now able to move is naturally shifting conversations towards safety. Fears over lower cost robots from Asia with lower levels of safety may prove unfounded, however the implications to the industry overall if a major safety incident occurred could be catastrophic. Recent product launches are seeing a greater number of sensors added to avoid collisions and to overcome the drawbacks of using LiDAR to avoid obstacles. The MiR 1000 for example uses two LiDAR scanners, two 3-D cameras and also eight proximity sensors to detect and avoid obstacles. Whilst not ground breaking, this is becoming commonplace in terms of minimum specifications. The forthcoming RIA safety standard (R15-08) is due to be published in the coming weeks which will set minimum requirements for ‘industrial’ mobile robots. The introduction of these standards will help to set the bar for the industry (at least in North America and Europe) and may restrict sales of smaller or newer vendors who do not conform to them. Canvas Technology, which debuted its AMR technology (rather secretively) last year at MODEX was a notable exception from the exhibitor list at ProMat and several people commented on its absence. In somewhat perfect timing, news emerged on Wednesday evening that the start-up had been acquired by Amazon Robotics for an undisclosed amount. The company, which raised $15m in December 2017, had quite a unique approach using a vision-based AMR cart relying on 3D cameras to navigate. The acquisition by Amazon Robotics, will be a reminder and potential warning to the industry of its aggressive attitude towards competition. As with its earlier acquisition of Kiva Systems, this acquisition prevents Amazon’s competitors from gaining access to Canvas’ products and IP. When Kiva was acquired by Amazon, it had around a dozen major retail customers, which were subsequently left with millions of dollars of unsupported and obsolete technology. The acquisition of a key and strategic robotics vendor by a competitor must rank high on the list of risks that e-Commerce and major retailers have. Further acquisitions of mobile robot companies look almost inevitable and the ‘end-game’ for several vendors who have already accepted financial backing from major e-Commerce companies e.g. Flipkart (now part of Walmart) with GreyOrange, Alibaba with Quicktron, JD.com with Syrius, etc. The fears of being left without access to leading edge robotics are likely to be stoked by this latest acquisition by Amazon. 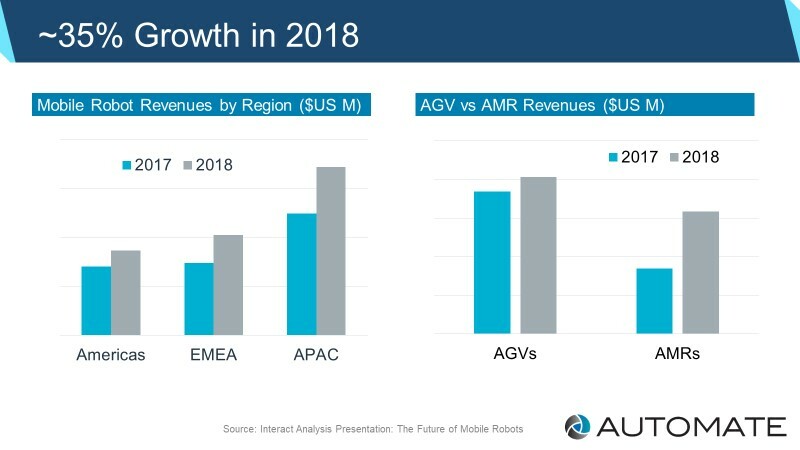 Regular, quarterly analysis of how mobile robot revenues and shipments are changing is available in the Interact Analysis Mobile Robot Market Tracker; whilst detailed annual analysis and forecasts for the industry can be found in our Mobile Robot Market Report.